Can I store kombucha in plastic bottles? Once kombucha has been brewed, it needs to be properly stored for flavor and safety. Kombucha should be kept in the refrigerator so that it stays cold and handy to drink. Most folks also flavor their kombucha in the bottle. This is referred to as secondary fermentation or F2. You can store your kombucha in any container that has a tight lid so that gas doesn’t leak out which would let the fizz escape. You can store kombucha in plastic, but strong glass is a better choice. As the kombucha continues to ferment in the bottle, the pressure will deform most plastic bottles. Also, plastic bottles contain chemicals that could leach out of the bottle into the kombucha. Read more about choosing the best bottles for storing kombucha. What are the best bottles for storing kombucha? The best bottles for storing kombucha should be strong enough to contain the pressure that the fermenting kombucha produces. Remember that kombucha continues to ferment in the bottle although at a slow rate in the refrigerator. A tight lid is essential so that the carbonation doesn’t escape. The best kombucha bottles should also be easy to clean so that you can use them again and again for storing kombucha. You can store kombucha in plastic bottles if you must. Be aware that plastic bottles may contain chemicals that the kombucha can leach out into your brew. Plastic bottles may also bulge and even crack from the pressure the kombucha produces as it continues to ferment. How long can I store kombucha? Once kombucha is finished brewing, it is ready to be cooled in the refrigerator and ready to drink. Most folks however make a kombucha recipe by adding flavoring ingredients to the bottle in a secondary fermentation (F2). Usually, the F2 takes a few days. After a few days, the kombucha has built up the right amount of carbonation and it is time to cool it in the refrigerator so it is ready to drink. Kombucha home brewers typically store their kombucha in the refrigerator for a few weeks, up to a month, or possibly, a bit longer. It is important to note, that although refrigeration slows down the fermentation of the kombucha, it does not stop it entirely. So, over time, the kombucha will become less sweet and the carbonation will increase. As long as the pressure in the bottle does not cause it to leak, you can store kombucha in the refrigerator indefinitely. As explained, it’s flavor will change over time. If you don’t refrigerate your brewed kombucha, it will continue to ferment in the bottle at a rapid rate. It will become increasingly carbonated. If you are storing your kombucha in very strong bottles, it is likely to eventually leak out of the top. If your bottles are not made of strong glass, they could explode! That is why it is best to store brewed kombucha in the fridge! Must Kombucha be stored in the refrigerator? Kombucha that you purchase in the store is always found in the refrigerated section, and for good reason. Although refrigeration slows down the fermentation of kombucha, it does not stop it entirely. Kombucha that is brewed commercially is often filtered. Depending on the brewer, other processes are also used so that the kombucha does not continue to ferment in the bottle. Commercial brewers want their kombucha to be as shelf stable as possible. Nevertheless, kombucha should be kept in the refrigerator whenever possible. When kombucha is brewed at home, it must be kept refrigerated. In the process of transferring the kombucha from the fermenter to the bottles, most of the active components of the SCOBY (the symbiotic organism that transforms tea and sugar into the kombucha beverage) are still present in the brew. At room temperatures, home brewed kombucha will continue to ferment in the bottle at a rapid rate. It will become increasingly carbonated. Unless you are storing your kombucha in very strong bottles, they could explode! That is why it is best to store home brewed kombucha in the fridge! Will kombucha carbonate in the fridge? To home brew kombucha, we employ a symbiotic organism called a SCOBY. The SCOBY is composed of bacteria and yeast and is responsible for transforming the mixture of tea and sugar into the beverage that we call kombucha. It is the action of the yeast converting sugars into CO₂ that creates the carbonation (fizziness) in kombucha. This process proceeds at all temperatures, but is very slow at refrigerator temperatures. To carbonate kombucha at room temperature takes only a few days, if there are some sugars present in the bottle. The amount of sugar in home brewed kombucha depends on how long the fermentation was allowed to proceed. If the kombucha is very sour, there may not be much sugar left in the brewed kombucha. Adding more sugar in the form of fruit, fruit juice, sweet vegetables, or sugar itself, is the best way to create carbonation. Although this can be accomplished in the fridge, it proceeds at a much faster pace at warmer temperatures. 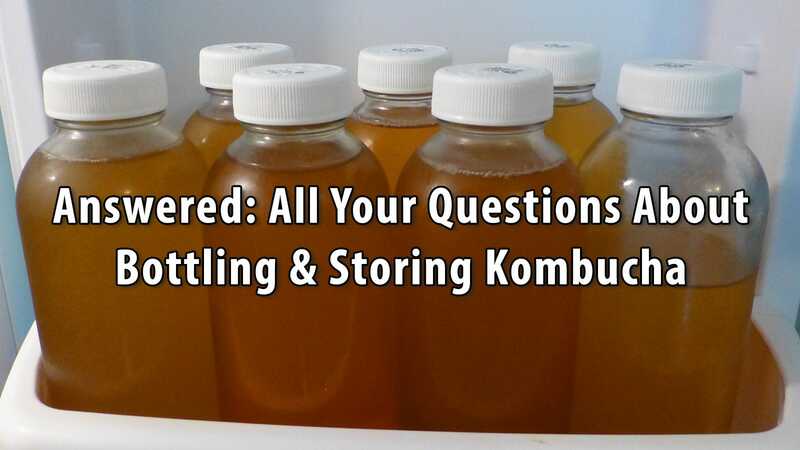 Does kombucha stored in the refrigerator continue to ferment? Once you decide that your kombucha is brewed to your liking, it is time to store it in bottles for drinking. Depending on the size of your brewing jar, there are a few ways to handle that task. One of the best ways is with an auto-siphon. Read: Bottle Your Kombucha the Easy Way With an Auto-Siphon to learn more about using an auto-siphon to transfer your home brewed kombucha. The kombucha that you transfer into bottles still has the active components of the SCOBY in it. That means that the kombucha will continue to ferment. At the low temperature of a refrigerator, the fermentation process will be slow, but it will not stop completely. As the residual sugar is digested by the bacteria and yeast, the kombucha will become less sweet as well as more fizzy. When is kombucha ready to drink? In the process of home brewing kombucha, a symbiotic organism called a SCOBY transforms a mixture of tea and sugar into kombucha. The basic kombucha recipe can be found here: The Basic Kombucha Brewing Recipe. Over the course of several days to a few weeks (depending largely on the temperature of the brewing environment), the brewing kombucha becomes less sweet as the sugar is digested by the SCOBY. At the same time, the brewing process adds many other compounds to the brew, which produces unique flavors. Home brewed kombucha is ready to drink when the pH is between 2.5—3.5. In the normal pH range, kombucha should taste tangy and slightly sour, but also have a hint of sweetness. It is up to the kombucha brewer to determine when the kombucha tastes ready to bottle. Some people like their kombucha to be more tart (at the lower end of the pH range) and some less so. As a home brewer, it is important to taste the kombucha each day as it nears completion and be ready to transfer it to bottles when it tastes the way you want it to. Putting it in the refrigerator greatly slows down the fermentation process and maintains the flavor for at least a few weeks. How Long Does Kombucha Last After Bottling? Home brewed kombucha continues to ferment after bottling. Storing it in the refrigerator will slow down the fermentation process and help it maintain its flavor and carbonation for weeks or even months. During that period, it’s flavor will change in subtle ways—it will likely become more tart as the sugar in the brew continues to be digested. Carbonation will increase for the same reason. You can filter the kombucha, removing as much yeast as possible, after the second fermentation to further slow down the fermentation process. Will Kombucha go bad if not refrigerated? Store bought kombucha is always found in the refrigerated section of the grocery store, so you should keep it refrigerated when you get it home. 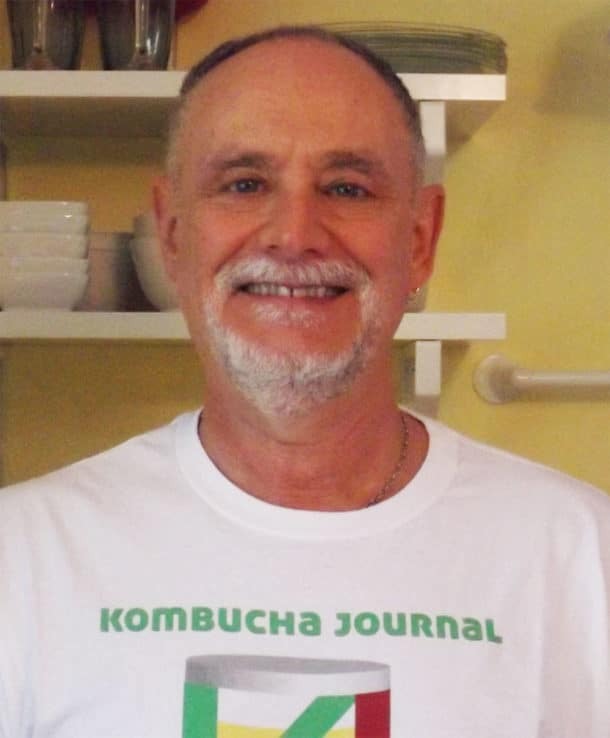 Commercially brewed kombucha is often filtered or stabilized to keep it as fresh as possible in the fridge and so it does not continue to ferment much in the bottle. Even so, leaving it at room temperature is not a good idea and the flavor and carbonation will eventually be affected. When we brew kombucha at home, it must be kept refrigerated. In the process of transferring the kombucha from the fermenter to the bottles, most of the active components of the SCOBY (the symbiotic organism that transforms tea and sugar into the kombucha beverage) are still present in the brew in small amounts. In not refrigerated or kept at about forty degrees, home brewed kombucha will continue to ferment in the bottle. It will become increasingly carbonated and pressure inside the bottle will increase. Unless you are storing your kombucha in very strong bottles, they could explode! Even if the kombucha stays in the bottle, it will taste less sweet as the SCOBY continues to digest the sugar and become overly carbonated. How long will kombucha keep once it is bottled? Once your home brewed kombucha has been bottled and flavored, and tastes the way you like it, it is time to put it in the refrigerator to halt the fermentation process. In the refrigerator, the kombucha will keep for weeks or even months. During that period of time, a small amount of fermentation will continue to proceed, depending on how much yeast and bacteria are present in the bottle. We have discovered that some flavors improve with age (a month or two) in the fridge. Others seem to taste better when they are consumed within a week of bottling. 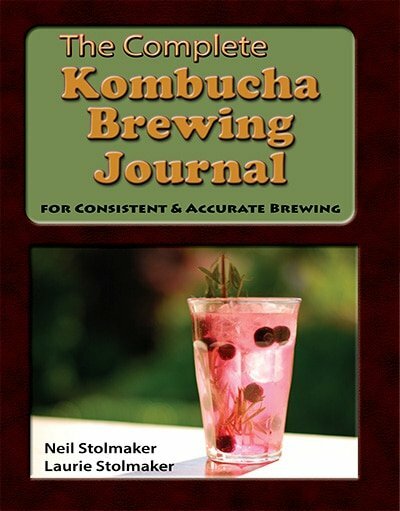 Keeping careful notes, such as with the Kombucha Brewing Journal system, will enable you to drink your home brewed kombucha when it is at its tastiest. Have a question about bottling or storing kombucha? Leave your question below.